MHR36's rectangular design fits flush against walls and occupies minimal space on sidewalks, yet provides a large 36 gallon capacity. Durable, heavy-gauge hot-dipped galvanized, fire-safe construction with Weatherproof Uni-Koat powder coat finish. C-Channel rails are fabricated from 16 gauge steel. Retainer bands hold can liners securely out of sight. Leak proof rigid plastic liners included with every unit. 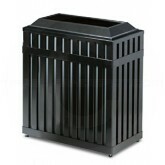 Round containers feature cable-secured lids; rectangular and square containers feature piano-hinged tops. Adjustable leg levelers provide stability on uneven surfaces. 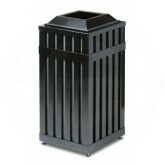 Rubbermaid MH24 Avenue Series Small Open Top Trash Can - 24 Gallon Capacity - 20 1/2" Dia. x 33 1/2" H - Disposal Opening is 9" Dia. 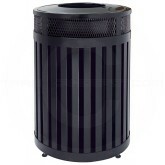 Rubbermaid MH46 Avenue Series Large Open Top Trash Can - 46 Gallon Capacity - 24 1/2" Dia. x 33 1/2" H - Disposal Opening is 12" Dia. 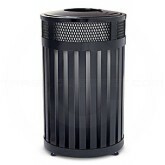 Rubbermaid MHSQ18 Avenue Series Square Open Top Trash Can - 16 Gallon Capacity - 16" Sq. x 32 1/2" H - Disposal Opening is 8" Sq.